Your car’s tires are one of the primary components of safe driving. Catastrophic accidents can result from blowouts or the inability to stop, which themselves may result from simply ignoring your tires. Proper car ownership and maintenance requires the tires to be replaced when the tread has worn down. There are ways to predict when your tires need to be replaced (or even just rotated). You have to know their language – and, of course, listen. Coin Test – Do you have a penny? Insert in in your tires’ tread with the top of Lincoln’s head going into the tire. If all of Abe’s head is visible, your tread is too low. You can also try the quarter test with a Washington-head coin. Insert the coin the same way, and if you cannot see the top of George’s head, you have at least the minimum tread for safe stopping. 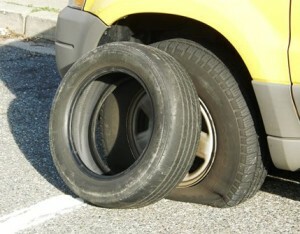 Look at the Tires – Cracks or blisters in the sidewall are not related to the tread at all but can be equally dangerous. Take a look at your tires from all angles. Even just a visual inspection of the tread can reveal the tread wear indicator bar which most tires have. Watch the Calendar and Odometer – If you live in a mild climate and do a reasonable amount of driving, your tires may not wear down to the nubs. However, tires do have an expiration date and may simply be old enough to require changing. The general rules are 50,000 to 60,000 miles and/or six years. If you notice any unusual vibration while driving, your tires may be telling you they need to be changed or rotated. Pay attention to your car, and check with a professional to make sure you’re rolling safe tires.